Florence Crick, Kate Gannon and Estelle Rouhaud describe the vulnerability of communities, and particularly small and informal businesses, in semi-arid lands. These communities have great potential to adopt more climate-resilient behaviours, if given targeted support to do so. Around a billion people, including some of the world’s poorest, live in semi-arid lands. Rainfall is scarce and unreliable in these ‘climate hotspots’ and the frequency and severity of extreme weather events is projected to increase due to climate change. Combined with high-levels of poverty and lack of development, these populations are likely to become more vulnerable over the next decades. Under the Paris Agreement, governments are already committed to supporting vulnerable populations to manage the impacts of climate change – impacts which will fall disproportionately on them. Yet supporting communities in semi-arid lands to adapt will not only buffer them against climate change but also drive economic development and help to achieve the 2030 Sustainable Development Agenda. In Africa small businesses dominate the private sector, which generates two-thirds of the continent’s investment, 75 per cent of economic output and 90 per cent of employment. So, the ability of small businesses in semi-arid lands to adapt to climate change – and grow in spite of it – is crucial for sustainable economic development. However, their potential can only be realised if adaptation and development are supported together. 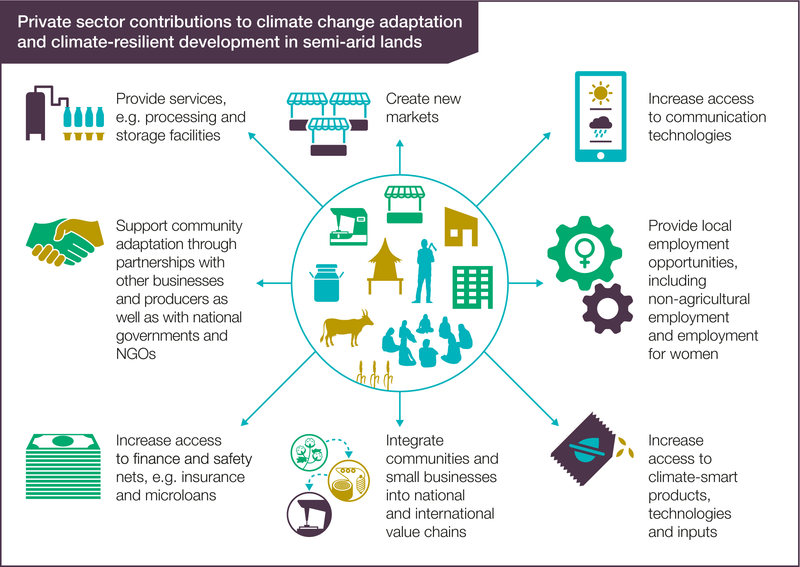 Households, producers and businesses in semi-arid lands already manage climate change risks by, for instance, diversifying their agricultural crops, herds and supply chains, or migrating. But some strategies are not sufficient to buffer them against current or future shocks and stresses. And some, such as the distress sale of assets at low prices to limit loss and damage, reduce their ability to cope with extreme climate events in the future. Businesses provide jobs and can support adaptation in their communities. They must be at the core of climate-resilient development. But they cannot do this effectively alone. New research, published by the Pathways to Resilience in Semi-arid Economies (PRISE) research project, argues that to unlock the potential of businesses to drive climate-resilient development, national governments and their development partners need to rapidly upscale support for private adaptation in semi-arid lands. Access to finance is a particular barrier to adaptation. Informal enterprises which dominate the private sector in semi-arid lands, and those with restricted access to land ownership – including women and producers using communally owned land, struggle to access credit. Even among formal enterprises, climate and business development finance is often unavailable to small and medium enterprises, which find it hard to access banks loans, but are not eligible for existing initiatives for micro-sized businesses. However, finance alone is not enough. Businesses also need access to climate information and early warning signals; climate-resilient transport, water, electricity and communication infrastructure; and policies which account for the flexible, mobile and informal nature of livelihoods in semi-arid lands. What’s more support must be inclusive. Some of the most vulnerable livelihoods have been largely excluded from government support. Small household-run businesses managed by women are particularly poorly supported. Their limited access to land, finance, educational opportunities and other assets means that women’s livelihoods are especially vulnerable to climate risks. Crucially, it is clear that to enable sustainable economic development in semi-arid lands, policy-makers can no longer afford to treat adaptation and development separately. 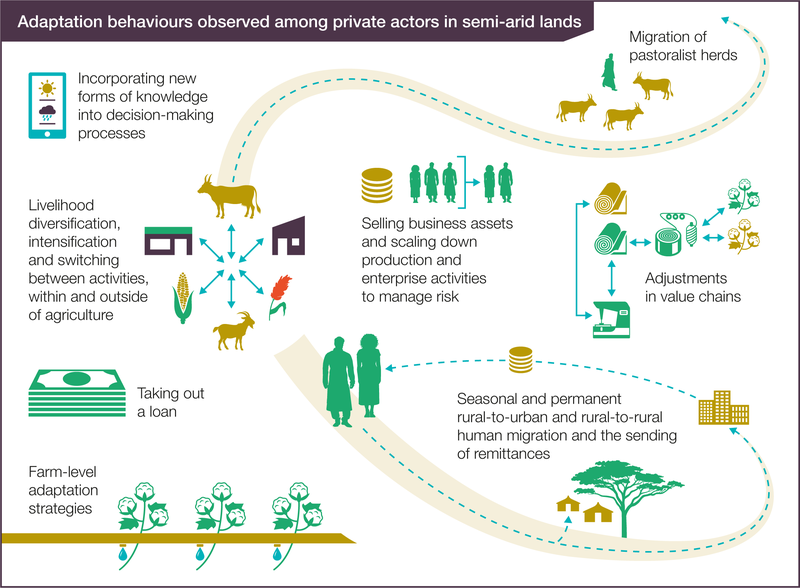 Currently national plans for economic development rarely address the adaptation needs of the private sector and National Adaptation Plans often don’t account for small and informal businesses, which provide most employment in semi-arid lands. Policy-makers must take a joined up approach in planning for adaptation and for development. There is an opportunity now to support businesses to drive climate-resilient development among some of the world’s poorest and most marginalised people. To miss this opportunity risks leaving these communities increasingly vulnerable to the impacts of climate change. Image: Kenyan herder, courtesy ILRI.